One of the more spectacular changes recorded for Halley during an apparition was the detachment event that occurred on April 12, 1986. This 3 minute exposure was taken using the Michigan Schmidt telescope at Cerro Tololo Interamerican Observatory. The resulting image clearly shows part of the ion tail structure detached from the comet. 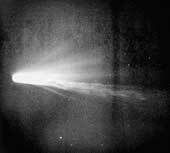 At this period, the orientation of the comet is such that the tail is foreshortened, with the prolonged radius vector pointing west of north.